The UAE's top leaders have congratulated an Abu Dhabi royal on his recovery after he was injured in a helicopter crash in Yemen last year. Sheikh Zayed bin Hamdan Al Nahyan - the grandson of the late Sheikh Zayed bin Sultan Al Nahyan - was among the three soldiers injured in the crash that took place in Yemen's Shabwah Governate in August 2017. On Monday, His Highness Sheikh Mohammed bin Rashid Al Maktoum, Vice-President and Prime Minister of the UAE and Ruler of Dubai; and His Highness Sheikh Mohamed bin Zayed Al Nahyan, Crown Prince of Abu Dhabi and Deputy Supreme Commander of the UAE Armed Forces, met Sheikh Zayed bin Hamdan at Al Bahar Palace in Abu Dhabi. They expressed pride in the courage of the Emirati soldiers in the battleground. Taking to Twitter on Monday after meeting Sheikh Zayed bin Hamdan, Sheikh Mohamed bin Zayed said the UAE's heroes make the country proud. The value of what is offered by the nation's son's sacrifices appear in their heroism and honorable stands, which are a source of pride and glory to all of us ... Zayed bin Hamdan and his peers have set wonderful examples in exertion, giving and allegiance," he tweeted. 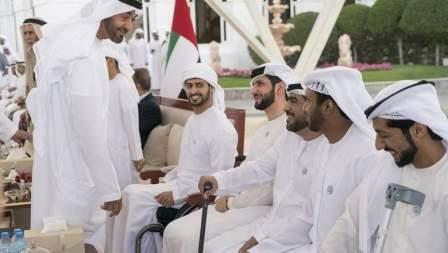 Sheikh Zayed bin Hamdan had returned to the UAE after treatment abroad on Saturday. Welcoming him back then, Sheikh Mohammed bin Rashid had tweeted that Sheikh Zayed bin Hamdan was the pride of Emirati youth. "The UAE, its people, and leaders rejoice at the return of Sheikh Zayed bin Hamdan," Sheikh Mohammed said. "The namesake of the UAE's founder ... the best among those who represent the bravery of its noble soldiers. "Sheikh Zayed bin Hamdan is a perfect model and inspiration to his generation. The country is proud of him and of people like him. Our brave soldiers will be braver and stronger, and the spirit of sacrifice will get established in our youth and our soldiers." Sheikh Mohamed bin Zayed had tweeted: "When the challenges come, sons of the UAE rise up to face them. And they are honoured to respond to the call of their homeland. Sheikh Zayed bin Hamdan is one of our Emirati heroes. There is no fear if our country has people like them." Four soldiers were also martyred after the helicopter in which the men were travelling crash-landed following a technical failure.